There are storage technology options that you can choose to get better performance and redundancy. RAID storage is one of the options that can be considered against regular hard drives. The article tries to compare the two options and highlight some of the pros and cons of each. 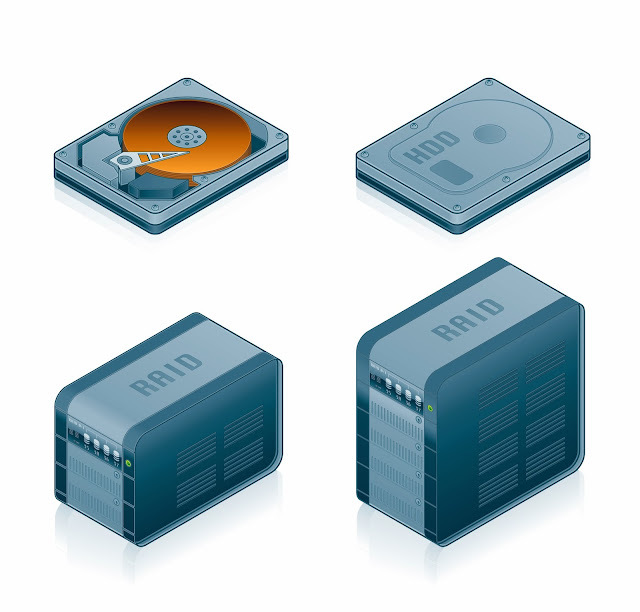 RAID, an acronym for Redundant Array of Independent Disks, is a technology that allows combining several disks into a one contiguous storage. Thus, the general difference between a RAID and typical hard drive is that using a RAID you can create some really big data storage. As of now, the maximum capacity of a typical hard drive you can buy is 4 TB (Hitachi); combining disks into a RAID, you can get almost any reasonable capacity. Also, recently new technologies based on RAID have become widely available; it is about Storage Spaces and a thin provisioning feature of Windows 8.1 and Windows Server 2012 R2 that allow creating virtually unlimited data storage. Another difference between RAID and non-RAID systems is complexity. In RAIDs, data is being placed not only according to commands of the file system driver, but also following the pattern of the particular RAID layout. More than that, there are RAID types for which there is no generally accepted standard layout pattern. For example, RAID 6 arrays created by different controllers use different block placement pattern and sometimes even compute parity differently. On the one hand, a RAID ensures more reliability with respect to disk failure; on the other hand, RAID arrays still have a single point of failure - controller in case of a hardware RAID or managing software in a software RAID. When a controller fails, there is significant chance to lose all the data stored on the RAID. This also includes operator errors, for example wrong actions during the rebuild that nullify all reliability based on data redundancy. If you need to place a large amount of data of an approximately similar purpose, for example backups that cannot be divided into logical groups (as it would be in case of movies and music) then stick to a RAID because it makes it easy for you to store data. When talking about non-RAID storage devices, we often imagine a regular hard drive meaning that this is a system limited by capacity. As mentioned above, nowadays, this is about several terabytes and the annual increase in the hard drive capacity is far from 1 TB. Obviously, non-RAID storage loses to a RAID system in terms of capacity. Typical hard disks have relatively slow read and write speed. Creating a RAID of several disks typically improves performance somewhat. The notable exceptions from this are tasks where many write streams are used (for example video conversion). In case of multiple simultaneous data streams, assigning each stream to a designated hard drive provides better performance than combining all drives into a RAID array. Also, we shouldn't forget about solid state drives (SSD). An SSD drove the final nail into coffin of a RAID0 that was for a long time considered a perfect choice to place an operating system on it for maximum performance. Many know that a hard drive can fail due to a logical or physical issue. With a RAID, people often think they are immune to data loss because they have a RAID that is usually redundant. In practice, it is not always true since there are failures affect the RAID itself. For example, if you deal with a hardware RAID, one of the common failures is a controller failure when you completely lost access to the data. Another common issue is an operator error, for example, wrong actions during RAID rebuild. In both these cases, before recovering data you need to restore RAID configuration: number of disks, disk order, block size, start offset at the member disks at which user data starts, and so on. If you ever face such a problem, look at ReclaiMe Free RAID Recovery, a free utility that is capable to detect RAID parameters automatically. Nowadays, it becomes clear that RAID arrays are creeping up to home users. This is most clearly seen in the recently introduced Windows 8.1 that has special features to deal with large storage devices and RAID technology. Developers greatly simplify both the process of creation of such storage and the process of adding disks if free space comes to end. However, the life of non-RAID storage devices doesn't end at this point. If capacity of a typical hard drive is enough for you, use non-RAID devices for their simplicity and mobility. Written by Elena Pakhomova of www.ReclaiMe.com, specializing in data recovery solutions for storage devices from MicroSD to Bigfoot hard drive, you name it.